Capt. Robert Olsen of Knot@Work Fishing Charters is putting his clients on a variety of offshore fish off the coast of Charleston. A recent bottom fishing trip in 100 foot of water netted limits of 5 different species of fish, including triggerfish, which bit throughout the day. Black sea bass, grouper, and snapper were also plentiful on this trip, and Olsen's crew landed the fish on a variety of cut bait and jigs. Olsen has a brand new boat, and fishes out of Shem Creek. 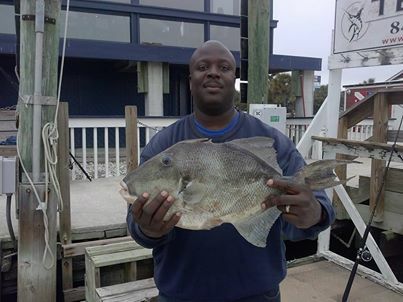 He fishes inshore, nearshore, and offshore, and can be reached at 843-442-7724.